In medium bowl, mix crushed cookies, sugar and melted butter. Press mixture firmly in bottom of 13x9-inch pan. Place sliced bananas evenly on top. Freeze 20 minutes. Place scoops of softened ice cream on top of bananas; use spatula to carefully spread into even layer. Top evenly with whipped topping. Cover and freeze at least 4 hours until firm. Just before serving, in microwavable bowl, microwave hot fudge sauce uncovered on High 15 seconds. 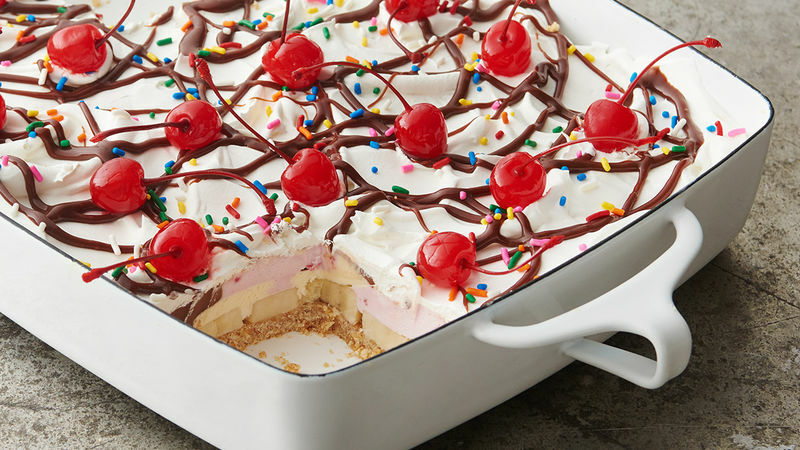 Drizzle with hot fudge sauce, and top with sprinkles and maraschino cherries. Cut into 5 rows by 4 rows. Store covered in freezer. Use food processor to finely crush vanilla wafer cookies.